After almost a year of working on what we called our 'Secret Project', Jessica Tate and I are excited to announce our new business, Sunrise Author Services! This is a business for authors created by authors. With several years of self-publishing experience, we know all the work that goes into publishing a novel, and we want to help you. Some of the services we'll be providing including graphic design, author promotion, and personal assistant services. This will also be a great opportunity for book bloggers to discover new authors, read ARCs, and help promote authors who are new to them and maybe even old favourites. This is where you come in. 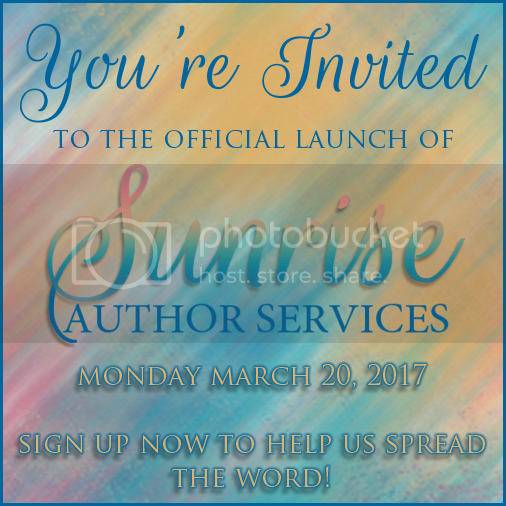 Jessica and I are looking for people to help spread the word about Sunrise Author Services. If you'd be willing to share a blog post, a tweet, a Facebook post, and/or Instagram post during the week of March 20th when we officially launch, we'd be incredibly grateful. We're a small business with big dreams, and you can help us achieve those dreams by spreading the word! Sign up here to help us with the launch the week of March 20th. We'll send an email with everything you'll need a few days before the official launch. If you're an author who's looking for help with promotion or you're in need of some graphics, sign up for our author newsletter, which will include exclusive discounts and promos. If you're a blogger, sign up for our blogger newsletter, which will include information about ARCs, promo opportunities, and giveaways. As incentive for signing up, everyone who helps us spread the word will be entered to win a $5 gift card (Amazon or B&N). If enough people sign up, we'll add another $5 gift card for a second lucky person!